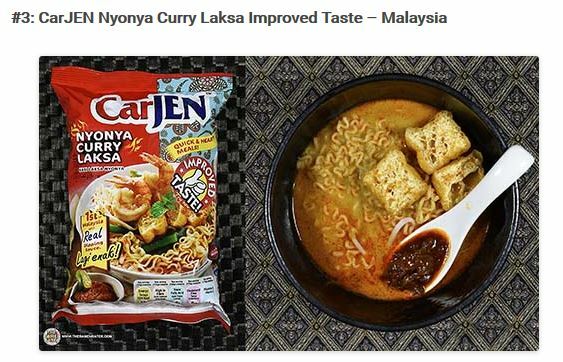 Carjen Food Nyonya Curry Laksa [Improved Taste] is now the world’s third best instant noodle in the pack category, according to The Ramen Rater’s latest 2016 top ten list. In the latest edition, Singapore’s Prima Taste Laksa Wholegrain La Mian has finally toppled MyKuala to secure the top spot.Carjen Food’s J.J. Snek Mi is also on the 7th spot in The Ramen Rater’s Top Ten Instant Noodle Snacks of all time 2016 Edition. Interestingly, the Carjen Nyonya Curry Laksa, the Carjen Otentiq and one more brand from another company took part in the Malaysia edition of the Product of the Year (POY) 2016/17. With the new accolade, we will be seeing Carjen gaining a lot more shelf space and more publicity going forward.